Baltic Madness • Estonia • Journeying • Why Adventure? “Is that the sea of love Dad?” asked Hannah catching sight of a shimmer of blue through the trees. But my mind was elsewhere, trying to figure how out to ask the young man in Estonian army khakis whether we could ride down the road he was blocking. As we approached he waved a yellow flag at the car in front, turning it around and sending it obediently back in the opposite direction. with these?” I gestured to our two articulated bicycles. He paused before replying, long enough for me to think he hadn’t understood a word. “It will be OK. They will only close the road when the race is started,” he said and lowered his flag. It was obvious something was going on in Otepää from the route markers, marshals, signposts and road closures. Now we knew it was a race; and we were somewhere on the course. As we headed down the hill towards the lake we passed a dozen sweat glazed men in athletic pants, stabbing on Nordic walking poles making giant striding hops uphill, like emus on an uphill version of the hundred metre hurdles. At the bottom of the hill, sitting comfortably in the shade, two large women shouted at the slower men to run faster, hop higher and sweat more in the rising mid-morning heat. As we passed I wondered if this was the race or a warm up for it? After all Estonians seem to love their unusual sports, like kikiing, in which people compete to make a wooden swing rotate through 360 degrees as often as possible, something the boys tried to emulate, or competitive wife carrying, which I refuse to contemplate. “Is THAT the sea of love?” asked Hannah again as we passed the hopping men and wound along the road alongside Otepää’s Holy Lake, Pühajärv , a tranquil lake psychics believe has special energies and blessed by the Dalai Lama. Estonian legend has it that if a couple swim in the water on midsummer solstice and drink together from a silver goblet they will stay in love for ever. Which to a four year old girl makes it the sea of love; which to a Dad makes it hard to refuse a swim, even if it’s not midsummer. But access wasn’t easy on this narrow road especially with a motorcade of police car and motorbikes approaching, lights flashing. The lead car stopped momentarily ahead of us and lectured a couple already bathing in the lake to stay put. So as the motorcade passed I thought it best to pull into the roadside just in case a large group of hopping men was around the corner. And so, stuck on the road on a blind corner, we waited for the real race and hoped we weren’t too much in the way. The first few riders weren’t long in coming but they didn’t seem to notice us. “Is it some kind of Estonian cycle race?” asked Matthew. And it did look like it, kind of; perhaps a local Estonian club race. But something wasn’t quite right. Like the body shape of the competitors. Too much upper body muscle for cyclists? And very intent, too serious? The lead competitors passed fast and furious, heads down, arms locked out in front, race numbers painted on bulging biceps, legs spinning at racing cadence, aerodynamic helmets slicing through the air. No time to look at us. Race to be won. “Can we go now?” asked Cameron over and over. But we couldn’t, for fear of causing a pile up in the peleton, which surely had to follow soon. Already when racers came two or three abreast the clearance between them and our trailers looked dangerous. After the lead riders had passed, we began honking and ringing our bells to warn of our presence and show our support. “Can’t you move up so I can pull my trailer in more,” shouted Kirstie as a rider took advantage of Hannah momentarily distracting a fellow competitor with a particularly random honk of her horn. Passing four abreast on the inside his bike nearly clipped Kirstie’s trailer as he powered past. But there was no room for me to move up and no way to reverse nor time to cross the road to a more prominent position. I began to wish the army marshal had kept his yellow flag down. 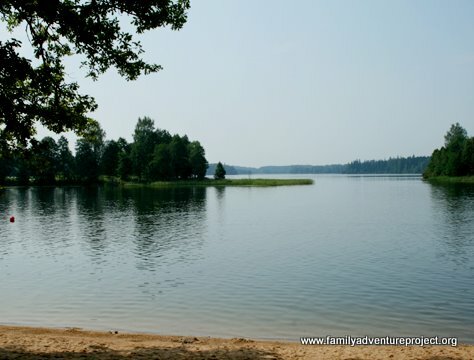 An hour or so later we arrived at Pühajärv beach, a sandy park a few kilometres before Otepää, packed this Saturday morning with families enjoying some sunny time together. As we rode up to the park, supporters out for the cycle race cheered us as we rode the wrong way down the course, applauding our own particular choice of endurance event. At the park the boys took over the water slide, while Kirstie de-stressed and Hannah and I sealed our fate in the sea of love. “You will love me for ever Dad now,” she pronounced as we got dressed again after our swim. “And you didn’t have a goblet,” teased the boys. But of course there was no need for either. We finally got our most meaningful swim in the sea of love. Don’t tell me we’d been obstructing an international triathlon? “I don’t think it’s the local cycling club,” said Kirstie as we approached what was clearly the finishing area, “Please tell me my trailer wasn’t obstructing an international athletics event. The winner is a Brit! I love how your daughter completely made the “Sea of Love” every little girls dream love story – so cute. Those random occurrences of what we think are possibly some little local event that end up being legit are what make our days interesting on a completely different level – the unplanned opportunity to cheer someone from your country on – so fun!!!!!! @Cheyenne Being open to the unexpected is a great way to bring a little more adventure into your life. The Sea of Love is a cute story but what interests me about it also is how an enduring a moment it has proved to be post-experienc. It has developed a significance that was not necessarily there in the moment and has become a long lasting reference point for our relationship. And that too was unplanned and unexpected. What parent wouldn’t want that with their child?